Genesis Sparkster (JPN/USA) "100%" in 27:09.55 by Sonikkustar. The kingdom of Zebulos is once again attacked, this time by the neighboring Gedol Empire, whose ruler King Gedol decides that he can kidnap Princess Cherry as Bowser can kidnap Princess Toadstool. 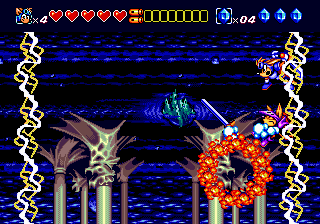 The rescuing hero, Sparkster, thinks that espionage is boring. So instead of infiltrating the Gedol empire by stealth, he goes in sword swinging and jetpack blazing, cutting down swaths of whatever poor lizardmen decide to get in his way. This game is the official sequel to Rocket Knight Adventures, whereas the SNES version with the same title is some sort of spinoff. Although the control is sluggish compared to the other two games, the author generally keeps the speed and pace fast, and exploits a bunch of tricks that make some bosses fall very, very fast. This is a 42 second improvement to the previous movie by Ferret Warlord.